Welcome back to “40 Days of Joy” after a weekend off. This makes a yummy appetizer or luncheon spread. Place chicken in a bowl; fake or shred finely. Add remaining ingredients except cracker or bread; stir well to combine. Cover and chill for 2 to 3 hours to allow flavors to blend. Serve at room temperature, or bake at 350 degress until hot and bubbly. Serve with crackers or bread. Makes 2-1/2 cups. This spread is delicious. The taste will vary depending up what type of salad dressing you use. I made a batch with dressing from a local Italian restaurant and the dip was on the zesty side. For the second batch, I used Wishbone’s House Italian which is not heavily seasoned. 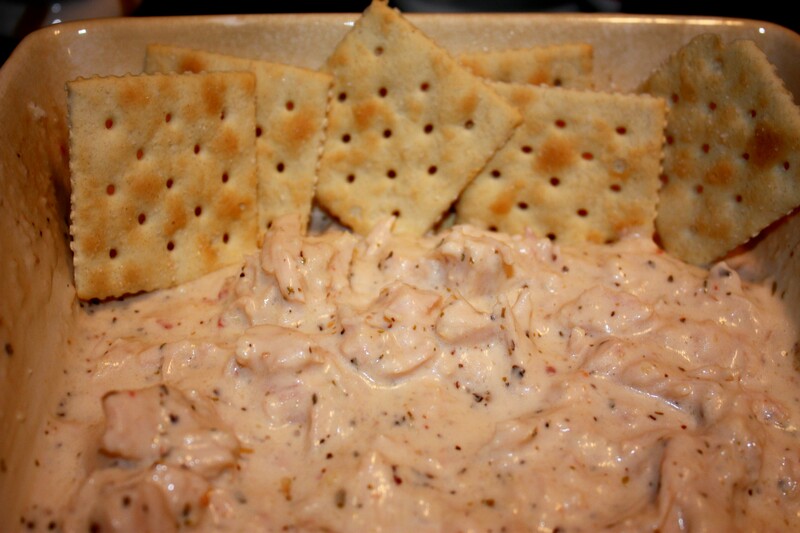 I used Saltine crackers but an Italian flavored cracker would pair nicely with this dip. If however, you use a bolder Italian dressing, I would use plain crackers or bread so your mouth is not overwhelmed with spices. I did not bake the dip but tried it after 3 hours in the fridge. I recommend you either add this to you holiday wish list, or get it as a gift for someone else. Most recipes appear easy to make, which is crucial when you are grieving. Your brain does not function at top speed during the first year so quick and easy are the most important ingredients in any recipe. The book is available at GooseberryPatch.com. Go buy the book and have fun making the recipes. Hopefully everyone had a wonderful Thanksgiving. I thought I would do a brief post today since you might still be sluggish from too much tryptophan. Starting new traditions at Christmas is a perfectly natural and acceptable thing to do in establishing a “new normal” for your life once widowed. New traditions can make you feel as though you are taking a tiny step forward in your grief journey. Each step forward is progress and prevents you from getting stuck in grief. A new tradition does not have to be something big like switching who hosts your family Christmas dinner. It can be something small, like my new tradition. I love looking through new cookbooks and trying new recipes. While I am not back to cooking or baking like I did when Joe was alive, each year I find myself working on my culinary skills a little bit more. After all I may end up getting married again and need to cook for family gatherings. A year or two ago, I fell in love with the “Gooseberry Patch” family of cookbooks and earlier this year received a copy of “A Hometown Christmas” , which contains favorite holiday recipes submitted by their readers. So this week, I will finally be making a couple recipes to share this coming weekend. (Yes, I am a little behind schedule) I highly recommend you get a copy and check out the recipe for “Old Country Cake” on page 152. You never will guess who submitted that recipe. Don’t be afraid to try a new tradition this year. You just might like it. Even if you are not grieving, try a new tradition to shake things up a bit. Yes, I am going to be published, but it is not a book. It all happened a few weeks ago when I got an envelope in the mail. I said to myself “Great! I’m even getting a reject letter from them.” Then I opened it and it was a letter stating my submission was going to be published with a release date of June 2013. All I had to do was sign a release letter and mail it back to them, which I did. Congratulations! We’re delighted to let you know that your recipe Old-Country Cake, will be included in our upcoming cookbook, Hometown Christmas, along with your name and hometown! The letter is from Gooseberry Patch. There will be a special private and shareable announcement when the book is published. I was at their site awhile back and they asked for submissions the new cookbook. So I got out paternal grandmother’s recipe and emailed it to them. After trading emails back and forth about some clarifications, I then received the letter. So watch your local bookstore and/or Amazon.com for the June release. You have landed in my special summer series “Swingin’ Summer Saturday’s and Sunday’s.” A series of recipes and survival tips designed to get you through the hot summer. This weekend the series is running from Friday – Monday and I’ve decided to share some of my favorite recipes that have appeared on this blog. Hopefully you will find a recipe or two this weekend. If not, check out the “Swingin’ Summer Saturday’s and Sunday’s category for more wonderful recipes. Thanks for clicking over from CBC Magazine. On Tuesday I will get back to the business of grief, extended unemployment and current adventures in my life. Have a fun and safe weekend and see you on Tuesday. Yes, this recipe is more work than what I originally intended when deciding to do recipes but my readers are my friends. This is a wonderful recipe given to me by a friend. The French fried onions really give it a fabulous flavor. I bake this quiche every Christmas and take it to our office…our maintenance man always seems to come by at just the right time for the last slice! Unfold pie crust and place in a 9″ pie plate. Sprinkle 3/4 cup onions evenly over bottom of crust; sprinkle with cheese. 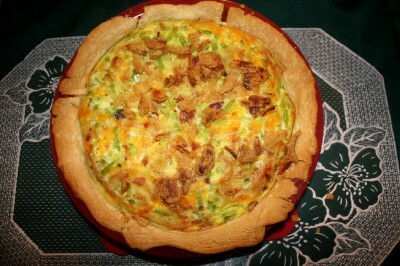 In a medium bowl, whisk together eggs, half-and-half or milk, bacon bits and green pepper, if using. Pour mixture over cheese. Bake at 350 degrees for 30 minutes, or until center tests done. Sprinkle remaining onions on top. Bake an additional 5 minutes, or until golden. Let stand 5 minutes before slicing. Makes 8 servings. Patch, Gooseberry (2009-07-01). Christmas with Family & Friends Cookbook: Favorite recipes, homemade memories and little touches that make the holidays warm & cozy. (p. 22). Perseus Books Group. Kindle Edition. Several months ago, I downloaded Kindle for PC. In researching recipe’s for today’s post, this cookbook was listed as “Cookbook of the Week” on Gooseberry Patch.com. Also, it could be downloaded for free (on Friday 12/16/11). Hey, I’m unemployed! I’ll take free anyday. Check out the site, not sure if you can still download it. This is very flavorful and delicious. I love the addition of French-fried onions rings. I see this as something different to take to someone who is having a tough holiday season besides the traditional Lasagna. Good Morning. Hope your day is filled with sunshine. FYI – There is a special post at OgleOhio.com today and tomorrow. I am going to be making the following recipe for the GriefShare group at church this week. Only I will be tweaking it. These are the best oatmeal cookies you’ll ever taste. They’re great with a glass of cold milk. In a large bowl, beat butter and sugars with an electric mixer at medium speed, until fluffy. Beat in eggs, one at a time, blending well after each addition. Add vanilla; set aside. Sift together flour, baking soda and salt. Fold flour mixture into butter mixture; stir in oats and nuts. Form rounded teaspoonfuls into balls and place on greased baking sheets 2 inches apart. Bake at 350 degrees for 5 to 7 minutes. Let stand on baking sheets for 4 to 5 minutes before moving to wire racks to cool completely. Store in an airtight container. Makes 4 dozen. I will be adding in dried cranberries, dried blueberries, coconut and white chocolate chips. This is being done to hopefully replicate the discontinued Blueberry Bar mix from Tastefully Simple. How much of each I will be adding has yet to be determined but will probably be 1 c. of the cranberries, blueberries and white chocolate chips. Will keep you updated on how this turns out. Well off to the grocery store. The natural sweetness from the peaches and honey is divine! Place half the peaches in a blender;reserve remaining peaches for another recipe. Add remaining ingredients to blender; process until smooth and creamy, about 30 seconds. If consistency is too thin, add a few extra frozen peaches to thicken. Serves 2. This was a lovely way to start a Saturday morning. It was smooth, creamy and naturally sweet. My grocery store did not have frozen peaches so I cut up 2 peaches and put them in the freezer overnight. This is the 4th recipe I tried from Gooseberry Patch’s Blue Ribbon family favorites cookbook. I enjoyed every one and highly recommend adding this book to your collection. I will be trying out more from this cookbook, especially have my eye on the Southern Oatmeal Cookies. I have some ideas for tweaking it, but more about that at another time.